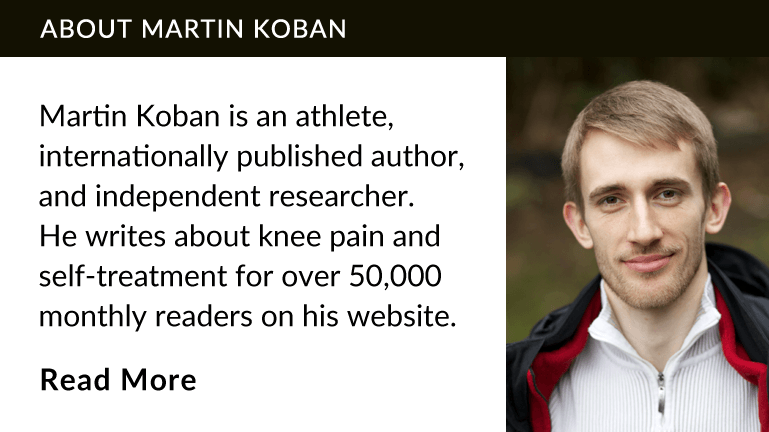 In this article we’ll talk about why I did that and how shoes can cause knee pain. There are three ways in which shoes can cause or contribute to knee pain. The first one is by changing biomechanics through an uneven sole. Here’s what you need to know. The longer you’re wearing a certain pair of shoes, the more its soles will be worn down. Depending on how you walk, wear of the soles may be uneven. The soles could be slanted to one side or diagonally for example. As you can see, the soles display a pronounced diagonal wear, but that’s only the first sign of trouble. Look at the shoe from behind and you’ll notice how much the sole is slanted overall. It doesn’t look like much, but if you wear these shoes, you’ll no longer walk on a horizontal plane. Each foot will be on surface that’s tilted by about 8 degrees to the mid-line of the body. This uneven wear was the result of walking in them with bad leg alignment for maybe a year. Once I became aware of this, I noticed that everything felt off-balance when wearing them, compared to walking barefoot, so I threw them away. A slanted sole places uneven loads on the legs, which increases your risk of knee pain through overuse of certain tissues. If you find any of your shoes have soles that are slanted to one side, throw them away and take a close look at how you walk. The second mechanism through which shoes can cause or contribute to knee pain is very similar. It’s the built-in slant most shoes come with, the heel elevation. 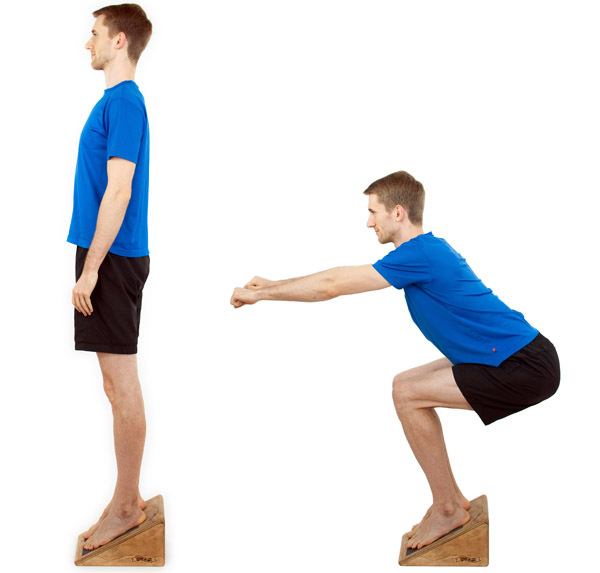 The elevated heel leads to a forward weight shift, placing more stress on the front of the knee. 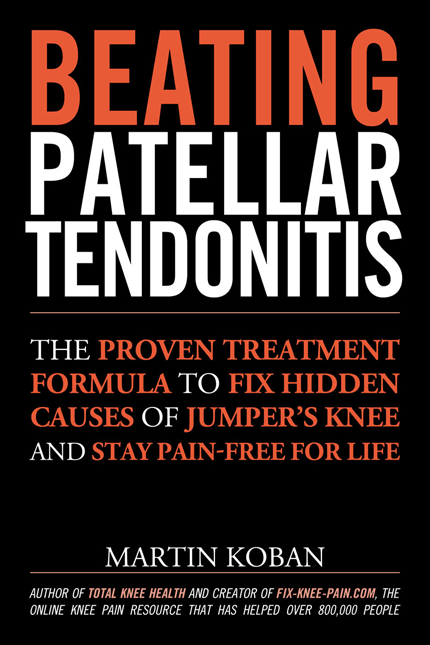 This is also why squats on a slanted board are used to stress the patellar tendon in tendonitis rehab. If all structures around the knee were able to cope with 100 units of stress per day, those 100 units would be evenly distributed among the front and the back of the knee ideally: 50 on the front and 50 on the back. If instead you have 60 on the front and 40 on the back, the tissues on the front have to carry too much and will become painful eventually. How soon this happens and whether it happens at all depends on factors such as your injury history, how resilient your knees are, how much you exercise, and of course how much of a heel elevation there is (among many other factors). A third way in which shoes can contribute to risk of knee pain is as an indirect cause. I don’t want to get carried away with too much detail, so let’s just stick to the cliff notes version. Thick soles will lead to a higher risk of ankle sprains because of the delayed ground awareness, impaired proprioception, and higher forces on the ankle due to the longer lever arms of the heel bone. An improperly rehabbed ankle can then leave you with limited mobility, leading to knee overload. Cramped toe boxes will cripple the toes and remove the big toe’s ability to protect against over-pronation. Women’s shoes are the worst in this category, but men’s shoes do come in the pointy variety as well. 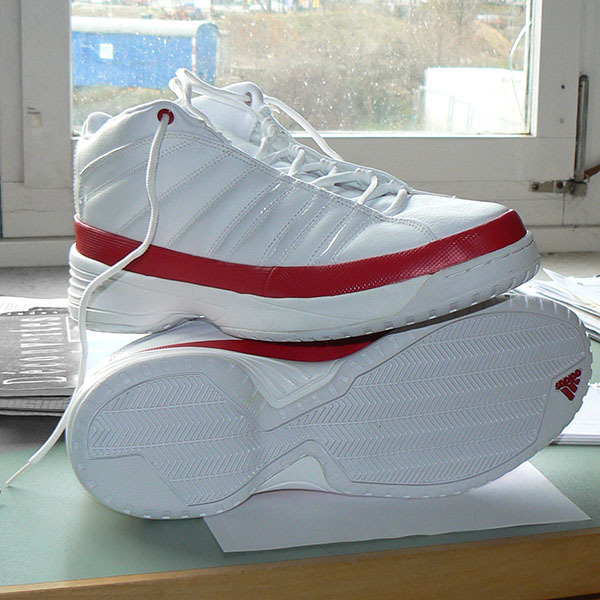 High-top shoes can restrict ankle mobility and can lead to overuse of the knee as compensation. Stiff soles will restrict big toe mobility, which also leads to detrimental changes up the kinetic chain. As you can see, it’s a complex issue. To make it simpler, my rule of thumb for every-day shoes is to avoid those with uneven wear or an elevated heel. For sports shoes, this becomes more complex and we’ll get to that in moment. In the end, I threw the pair with the slanted soles in the picture above and another pair of sports shoes away. Then I donated these to the German equivalent of Goodwill. Just look at the massive heel elevation of maybe 3 cm (2.5 inches) and the sole thickness of about 2 cm (1 inch). I did suffer 3 ankle sprains in similar shoes while playing basketball, but hey, at least they look pretty. A healthy shoe has a flat, thin, and flexible sole. 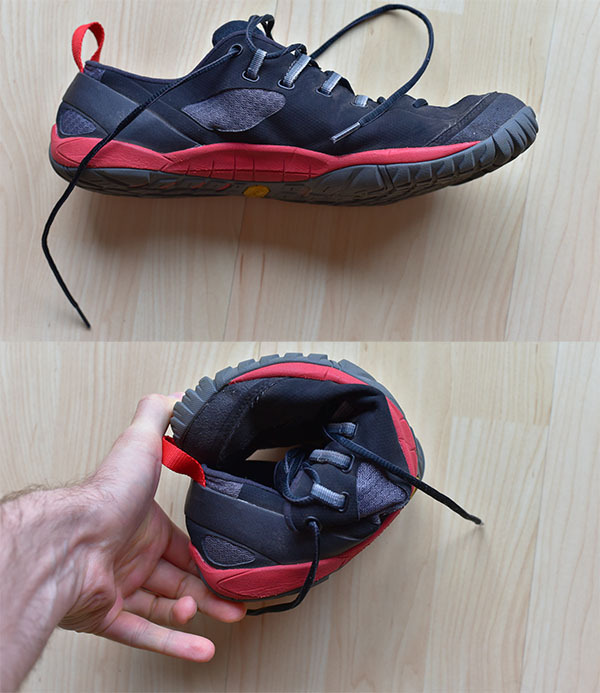 Here’s an easy test to see how flexible the sole is. The above picture shoes the ideal scenario, but I can guarantee you that 99% of the shoes at the average store will fail this test miserably. Even shoes in which infants will try their first shaky steps are usually as stiff as a piece of wood. Here is a list of companies that offer a wide selection of shoes that meet even the stricter criteria for healthy shoes. Is your favorite brand missing? Drop me a line on Twitter and let me know. Each of these has pros and cons, like everything in life. I highly recommend you browse for reviews online before buying anything. Some of these do have stores and if you can, try the shoes there before purchasing online. Here’s the shoe I tested on Amazon. I was saddened to discover that Merrell and Vivobarefoot seem to have quality control issues (information as of May 2017), with the surface material of their shoes tearing after a mere 6 months of normal use. I find that inacceptable considering their price. Should the same issues arise with the shoe I tested above I will post an update here. For explosive sports, I recommend tight shoes with laces. Anything else will not stay on your foot. 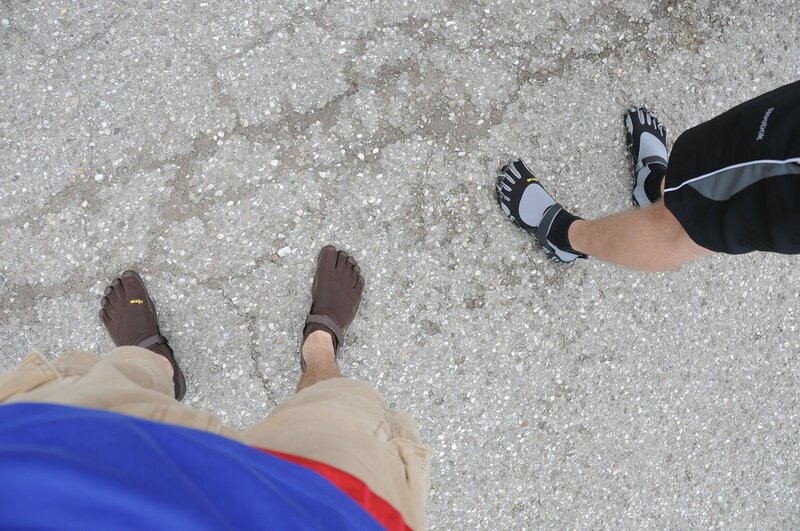 I used the classic toe shoes, Vibram FiveFingers, for a little over a year. I no longer wear them, mostly because putting them on is a pain as you have to wear toe socks as well. If you don’t wear toe socks they stink unbelievably after just one training session, although they also start smelling quickly even with socks. The sole wears down rapidly if you play sports that require pivot movements (I tried it with basketball). Q: How will the shoes you recommend help my knees? The flat sole will help even load on the front and back of the knee. This reduction of stress on the front of the knee allows for faster healing and reduces risk of further overuse. Additionally, the flexible sole and lack of ankle support allow for natural movement around the toes and ankles. You’re more likely to use your calves for shock-absorption when running and jumping and more force absorbed by the calves means less force travelling up into the knee. The down-side of this is that if you approach your training in minimalist shoes too aggressively, you may suffer overuse injuries of the lower leg. However, this does prove the load shift away from the knees and onto the structures of the lower leg. Q: Do you really need minimalist (“barefoot”) shoes to get rid of knee pain? No, you don’t, but the very thin sole can help restore better movement patterns more intuitively. 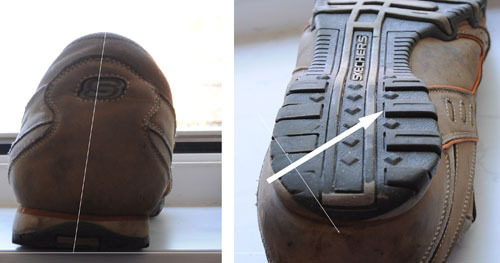 If your shoes have a flat and flexible sole (“zero drop”) they’re likely already okay. Q: How can I protect against over-pronation? Regardless of what the guy in the running store said, our legs come with in-built protection against over-pronation. This happens as a combination of the muscles in the hip controlling femoral rotation, the muscles in the lower leg controlling tibial rotation, and the big toe providing additional stability. Unfortunately, wearing supporting footwear weakens these mechanisms over time, which means you will have to rebuild strength in your hips and lower legs. You may also have to stretch and realign your big toes. Use these exercises to get started. If you’re absolutely positive you need orthotics, wear them, but start rebuilding strength in your hips, lower legs, and feet as well. Check out the link right above and look into the Janda short foot exercise. When I first put on minimalist shoes, I couldn’t believe how much I had to change the way I walk and run. Minimalist shoes make movement so much more pleasurable, because you’re connected to what’s happening below your feet. It’s extremely enjoyable, but also addictive. After wearing minimalist shoes for a year, every other shoe felt like putting my feet in a cast. The only times I’m willing to do that is in rainy weather and in the winter time. One thing I’m very disappointed with though is the design most of the minimalist athletic shoes come in. It’s almost like the designers are on LSD. Browsing these shoes offers a comprehensive study in bad taste. Fortunately, the effort it takes to find a shoe you like is certainly worth it and not just because of knee pain.